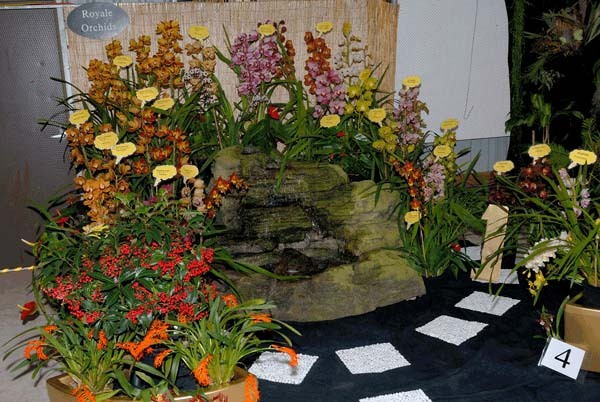 One hall filled with orchid displays and floral art. One hall filled with stalls selling orchid plants, flasks, orchid pots, and all orchid supplies. Ample free parking. Wheelchair access. Plenty of room for buses for picnics and barbecues. Lunches and coffee for sale all day. Early spring in Sydney and the fragrance of orchid flowers. Raffles are drawn throughout the day. National Park bushland with walking tracks and native orchids in flower. What more could the orchid lover ask? 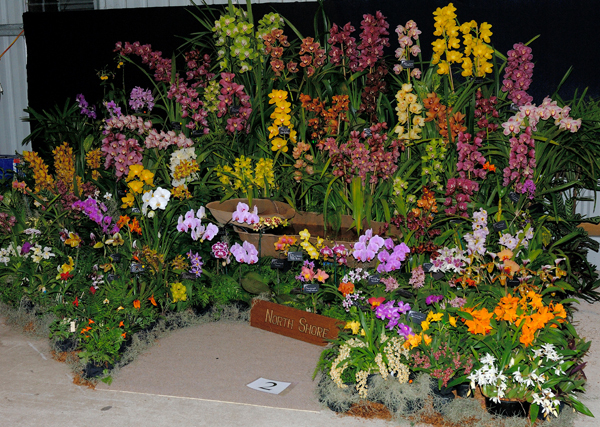 – The St Ives Orchid Fair. 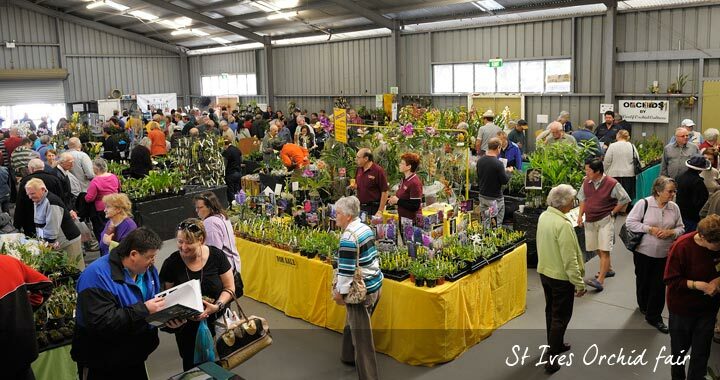 Well, the four orchid societies who got together to organise the St Ives Orchid Fair believe that this combination of venue, show and vendors means we have the premier orchid event in the State, and after 19 years we are still going strong. We thought maybe we could do something in our area, and we did. The joint societies’ organising committee quickly became a cohesive unit and worked well, efficiently, and hard, and the first Fair took place on Friday, Saturday & Sunday, 18th, 19th & 20th August 2000. 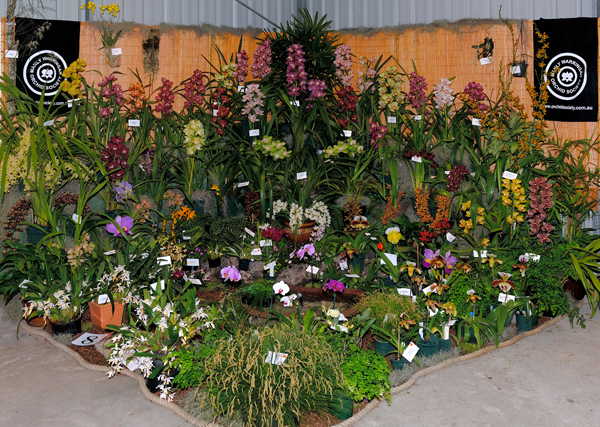 As August approached, the committee was excited but apprehensive, but we had good support from participating societies with large displays planned by the four organising societies plus Eastwood, S.P.E.C.I.E.S., and the Cymbidium Club, and also Royale Orchids. There were several table top displays booked and the addition of floral art provided a further dimension and we felt we had something to interest all orchid enthusiasts as well as flower lovers. In the other hall we had carefully planned the layout for the stalls for vendors of orchids, pots and fertilisers, etc. The four organising societies for the St Ives Orchid Fair also had a joint sales table. After all, for the amount of effort put in by them to stage an event like this, it is only fair that the members of the societies who do the work get some benefit. 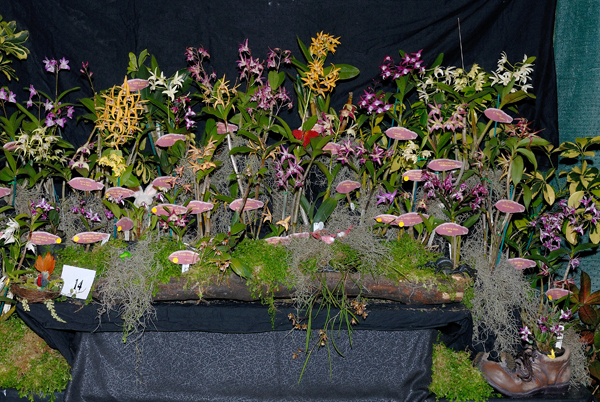 In issuing invitations to vendors the organising committee was aware of the desirability of providing a wide range of quality orchids for sale. The idea was that buyers would have plenty of choices, and should be satisfied whether they were after flowering plants or the latest seedlings. People would be able to choose from a selection including Cymbidiums, Phalaenopsis, Oncidiums, Cattleyas, native Dendrobiums, Sarcochilus, as well as Australasian species and hybrids, Masdevallias, Zygopetalums and many exotic species,. 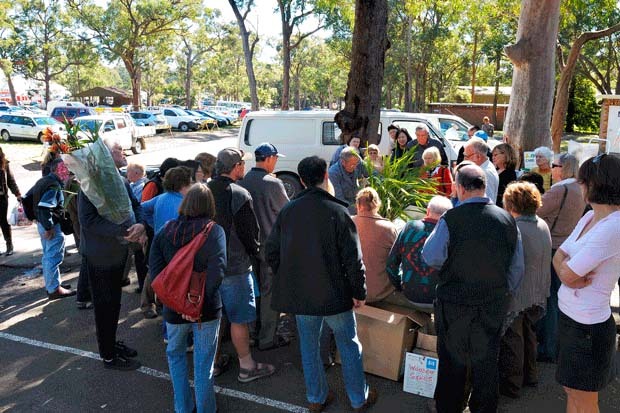 There are always new and exciting hybrids and species from our interstate and NSW venders being released at the St Ives Fair. It seemed we had a successful formula, and the event was repeated in 2001 and every year since. The quality of the displays each year has remained exceptionally high providing a bench mark for the other Fairs in NSW. St Ives Showground is set in bushland, and a short stroll from the display and sales halls you can find native beauties like Thelymitra ixioides, and Glossodia major. We are looking forward to the 19th annual St Ives Orchid Fair which will take place on Friday 17th, Saturday 18th, and Sunday 19th August 2018. There will again be an excellent range of vendors, displays, paintings, photography and floral art. See our Show schedule for further information.